This is a comprehensive consignment agreement for use by an importer / distributor of any physical product. You have a sophisticated turnkey import and marketing operation. You hold stock on consignment (pay only when you sell). You are in control of every aspect of the distribution channels and are in a position to decide what products to take, what prices to charge and how every element of the relationship will be managed. The concessions to the merchant in this document are largely limited to basic provisions without which a sensible merchant would refuse to sign. 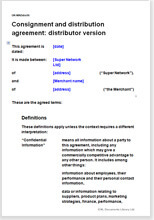 The contents of this document could be negotiated but its best purpose is to use as a standard terms document, to which any merchant must sign if he wishes to use the distributor’s services. The agreement is drawn so as to provide a full framework for a distributor working on consigned goods in any industry, for suppliers in any country. However, it will be necessary to add product specific terms for some products - for example food, medical products, software products, and products requiring special storage or security. The law relating to this agreement is largely common law, not statute law. That means you have great freedom, to make your own deal. For our part, we have drawn a document with many options. It is likely that you will find exactly the provisions you want, but you will also have to delete those options you do not want. The distributor is responsible for all aspects of compliance with local law, whether relating to the product, the customer, importation or duties and taxes. We have covered product recall, minimum sales requirement, how you want the whole subject of marketing to be approached and how the merchant will report to you. We have provided a “joined up” procedure taking in order > acceptance > delivery > risk > title > payment > returns, and so on. There are over 200 provisions in the document supported by over 3000 words of notes, including those supplied in a separate document. Plain English, our business understanding and thorough care help you to write the perfect document for your business. This agreement has been drawn to provide an armoury of ideas. You can be tough or tender.